The contact system can be used for alarm functions or simple actuating controls. The contact is simply set at the customer defined value where the contact function is required. 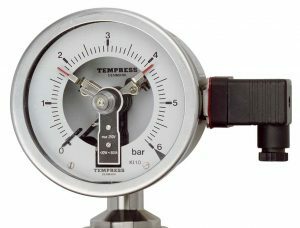 With a few exceptions TEMPRESS’ dry and liquid filled pressure gauges and thermometers can be delivered with one, two or three built-in contacts. TEMPRESS’ product range offeres contact systems without magnet, with magnet, inductive or electric impulse. For systems with or without magnet the contact pins are standard in silver but can also be supplied in gold – e.g. for low voltages such as 24VDC. For detailed description of each contact system and its specifications please refer to TEMPRSS’ datasheet for precision contacts.